Also known as brunost (lit. brown cheese). It is a firm, brown cheese made from the whey of the milk. It has the appearance of caramel and a slightly sweet flavour and fudge like texture. Made with pasteurised cows milk. This cheese has large irregular holes and has a yellow-wax rind and a semifirm yellow interior. The flavour is mild and slightly sweet. 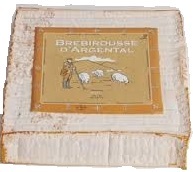 It is an all-purpose cheese that is good both for cooking and for eating as a snack. Made with pasteurised cows milk.